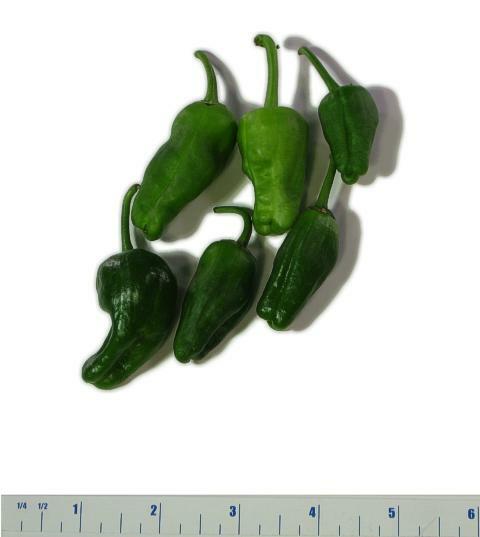 General Information: Pimientos de Padrón are small green peppers named after a town in Galicia, Spain. That mildly sweet green chile from the Galicia region, fried in olive oil and served by the plate, also headlines a village festival in its honor. Unremarkable in appearance the chile curves and grooves a bit and is somewhat ruddy. They are usually fried in salt and served as a tapa. Pimento is the Portugese term for chile peppers. Pimiento de Padrón is both a cultivated variety of chile and a recipe for that chile. The unique trait of the pimientos de Padrón is that most pods are mild, but about one in five is very hot. At their best, eating them is rather like playing Russian Roulette. Sometimes almost all of them are highly explosive; occasionally, an entire batch is sweet.